Vanilla bean sponge with vanilla bean syrup layered with vanilla bean buttercream and raspberry conserve. 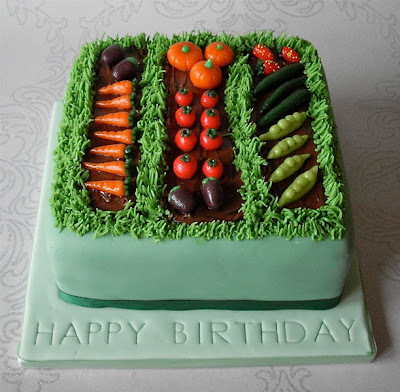 The vegetable garden is made with buttercream 'grass', dark chocolate ganache 'soil' and marzipan carrots, aubergines, pumpkins, tomatoes, strawberries, cucumbers and pea pods. Wow! How creative!! :) Love it. You are so very creative. This is just amazing! I wish you could teach me to make some! You're very talented!! !